Today, I’m going to talk about great American traditions. Vigilant readers will note that this subject is especially timely, since we recently completed the Great American Tradition of Thanksgiving, followed closely by the Great American Tradition of Following A Shopper Through The Mall Parking Lot to Get His Space. This means we’re now back at work, undertaking the Great American Tradition of Sharing Thanksgiving Pleasantries With Our Co-Workers. Although it’s been a while since I worked in an office, I remember this tradition well. It comes around the Monday after Thanksgiving, and it involves your especially cheery co-workers cheerily walking around and cheerily asking everyone about their Thanksgiving. “So, Bob, how was your Thanksgiving?” they’ll say. Or, “So, Jane, didja have a good Thanksgiving?” They do this all day, even though Bob, Jane, and everyone else always replies the same way: “Good. Relaxing. How was yours?” By the end of the day, you really want to take the cheery Thanksgiving asker, remove his giblets, and stuff him in the oven, but that’s not part of the tradition. Fortunately, I’m here to distract you from this great, and not even slightly irritating, American tradition for the next few minutes by discussing yet another truly great American tradition: the first car. I don’t know about you, but I remember my first car well. It was a 1996 Volvo 850 Turbo, and it was – and I’m sorry to have to tell you this – way better than your first car. For one thing, it had more features. It had leather, and a sunroof, and a CD player, and cupholders, and power windows, and power seats, and memory seats, and cute little wipers on the headlights. Even Rolls-Royce doesn’t have wipers on the headlights, so this car was way better than a Rolls-Royce. It was also faster. In fact, it was one of the fastest cars on the road. Sure, it only put out 222 horsepower, but it felt like 300 horsepower, or, if it was cold, approximately 950 horsepower. Probably under-rated from the factory. Yes, there are some faster cars, like maybe a few Ferraris, and possibly the Bugatti Veyron, but I wasn’t likely to encounter one of those on my morning commute to high school. It wasn’t just fast. It also handled well. I know there are some cars out there that do a great job on the track, like the Ariel Atom, and of course Formula 1 race cars, but I would estimate – conservatively – that my 850 Turbo could do 95 percent of what those vehicles can if you’re on a track, or, if I’m behind the wheel, maybe 96 percent. 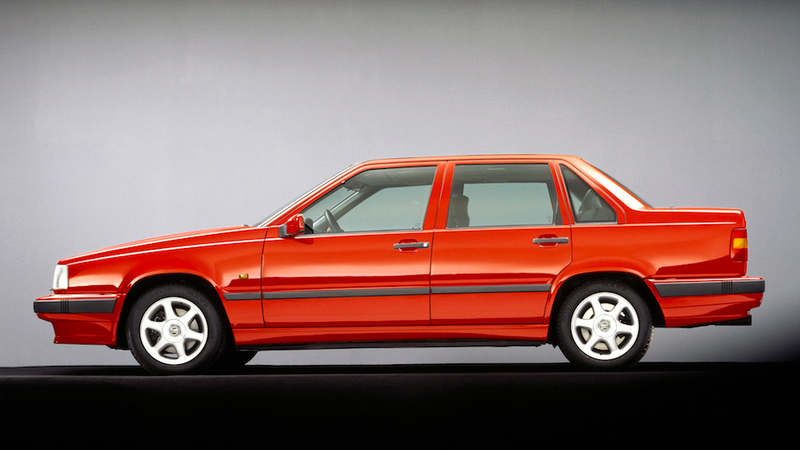 I owned my 850 Turbo from 2004 to 2006, at which point my parents sold it to a young couple who wanted to use it as a “starter family car.” This is, of course, a laughable notion; the only way a Volvo 850 Turbo should be used as a “starter car” is if you want to get started learning how to replace all the underhood components on a Volvo 850 Turbo. But that’s beside the point. The point is that, because the 850 Turbo was my first car, I loved it dearly. And because I loved it dearly, a legend started to grow in my mind after it was gone. The features. The speed. The handling. In quiet moments, I would daydream about how great that car was. How could I ever let it get away?! And then I had the chance to drive one again. For one thing, it turns out that you don’t need to be in a Bugatti Veyron to win a drag race with my old Volvo. You can be in a lot of vehicles, like a Honda, or a Jeep, or a wheeled office chair. Oh, and that razor-sharp handling? After driving dozens of other cars over the years, I quickly realized my 850 Turbo’s roadholding abilities were less Ariel Atom and more Ford Econoline Carrying A Large Dining Room Set. It didn’t help matters that the 850 Turbo’s steering wheel is roughly the size of a trash can lid. In other words: I got it wrong. My first car wasn’t anywhere near as great as I remembered. But I’ve noticed that I’m not the only person who remembers his first car a little too positively. I have a friend with a new Ford Fusion who swears to me that the greatest car he ever owned was his first car, a 1988 Toyota Celica GT. He’s always talking about how quick it was, and how well it handled, and how cool it looked, and he’s always looking at Craigslist to find another one just like it. You can’t shut him up. So the other day, I decided to check out the particulars on the famous 1988 Celica GT. It turns out the car had an 8-valve, 2-liter 4-cylinder that put out – get ready – a whopping 115 horsepower. It also sat on 13-inch wheels, included a four-speaker stereo, and boasted one of those power antennas Toyota couldn’t stop putting in their 1980s vehicles, presumably in a concession to the touch-free carwash industry. I call this phenomenon “First Car Syndrome,” and I’m here to tell you that you’re probably suffering from it. If you’re out there driving a modern car with airbags and infotainment and high-quality interior materials and a powerful engine, or even a mediocre engine, or really any engine, it’s probably better than whatever shitbox you drove to high school. But I bet that won’t stop you from spending the next half-hour browsing Craigslist for a clean example of your first car. I don’t blame you, though. It’s better than exchanging Thanksgiving pleasantries with your cheerful co-workers.